Satoru Iwata (岩田 聡) was a programmer and the fourth President and CEO of Nintendo from 2002 to 2015. He had expressed his love and interest in video games ever since he was young and later majored in computer science at the Tokyo Institute of Technology. Iwata joined HAL Laboratory in 1980 while attending the university. During his early years at HAL Laboratory, he worked as a programmer and collaborated closely with Nintendo. Notable titles he contributed to at this time include EarthBound and the Kirby series. Following the downturn and near-bankruptcy of the company, Iwata became the president of HAL Laboratory in 1993 at the insistence of Hiroshi Yamauchi, Nintendo's president at the time, and brought the company to financial stability. 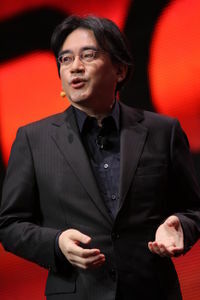 In the following years, he assisted in the development of the Pokémon series and with Masahiro Sakurai in making a prototype of a fighting game called Dragon King: The Fighting Game, which would eventually develop into and release as Super Smash Bros. Iwata joined Nintendo as the head of its corporate-planning division in 2000. In June 2014, a tumor in his bile duct was discovered during a routine physical exam. It was successfully removed and Iwata returned to work in October of that year. However, the issue resurfaced in 2015, and Iwata died at the age of 55 from its complications on July 11. He is succeeded by Tatsumi Kimishima, who preceded Reggie Fils-Aimé as president of Nintendo of America and previously served as Managing Director of Nintendo Co., Ltd.
Iwata has played key roles in developing, advertising, and announcing various Super Smash Bros. titles. In addition to closely assisting Sakurai in the production of the 1999 original, he also played a similar role in the development of Super Smash Bros. Melee and contributed greatly to the game's debugging process. In the credits of Super Smash Bros. and Super Smash Bros. Melee he received a special thanks. At E3 2005, Iwata offhandedly announced Super Smash Bros. Brawl while the game was neither in development nor even planned. He approached Sakurai the next day and asked him to direct the next Smash game. In the trailer for the Mii Fighters, Iwata is seen battling against Reggie Fils-Aimé's Mii Brawler as a Mii Swordfighter. Iwata's Swordfighter Mii with his Mario amiibo after defeating Reggie. Super Smash Bros. for Wii U's Japanese release date happens to coincide with Satoru Iwata's birthday while Super Smash Bros. Ultimate's global release date is a day after Iwata's birthday. List of developers significant to Super Smash Bros. This page was last edited on June 21, 2018, at 20:15.